Set an oven rack in the middle position and preheat the oven to 350°F. Season the brisket on both sides with salt and pepper. Lightly dust the brisket with the flour, then shake and turn to coat evenly. Heat the oil over medium-high heat in a heavy flameproof roasting pan or ovenproof enameled cast-iron pot just large enough to hold the brisket and carrots snugly. Add the brisket to the pan and sear on both sides until crusty brown areas appear on the surface here and there, 5 to 7 minutes per side. Turn off the heat and place the brisket, fatty side up, and any accumulated juices on top of the onions. Spread the tomato paste evenly over the brisket, then scatter the garlic and carrots around the edges of the pot. Cover the pot very tightly with aluminum foil (preferably heavy duty or two layers) or a lid, then transfer to the oven and cook for 1-1/2 hours. Transfer the brisket to a cutting board and, using an electric or very sharp knife, slice the meat across the grain into approximately 1/8-inch-thick slices. Return the slices to the pot, overlapping them at an angle so that you can see a bit of the top edge of each slice. The end result should resemble the original unsliced brisket leaning slightly backward. Check the seasonings and correct if necessary. If the sauce appears dry, add 2 to 3 teaspoons of water to the pot. Cover the pot tightly and return to the oven. Lower the heat to 325°F and cook the brisket until it is fork-tender, 1-3/4 to 2-1/2 hours, or longer if necessary. Check once or twice during cooking to make sure that the liquid is not bubbling away. If it is, add a few more teaspoons of water—but not more. 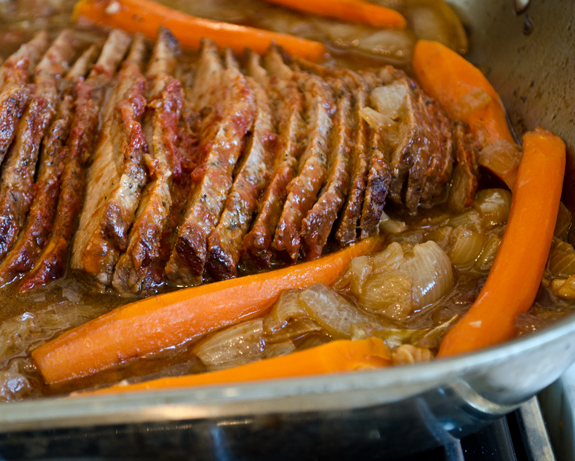 Also, each time you check, spoon some of the liquid on top of the roast so that it drips down between the slices. It is ready to serve with its juices, but, in fact, it’s even better the second day. It also freezes well.